BiSN, in partnership with Aker BP and Altus Intervention, has successfully deployed the world’s largest bismuth plug. The company specialises in metal-to-metal downhole sealing solutions and has been developing their Wel-lok M2M technology for a year. 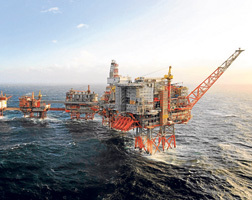 The technology can be utilized during well and rigless well abandonment, and was deployed via E-line in collaboration with Altus Intervention in Aker BP’s Valhall A-30 well in the Norwegian North Sea. The Wel-lok M2M technology aims to bring substantial savings to operators by eliminating rig costs and doing the work rigless. Conducted as a field trial, the tool was set to assess the efficacy of bismuth as a permanent seal for P&A operations instead of cement. With 3,500 kg of bismuth alloy, a gas tight surface seal was created inside 18 5/8” casing through a section milled window cut in the 13 3/8” casing, entering previously unchartered territory regarding weight, size, and precise setting procedures. “This project is an important step towards the adoption of bismuth well sealant technology. Wel-lok M2M drastically reduces the rig time needed to complete well abandonments (P&A) through the use of thermite heaters to melt bismuth-based alloys,” said BiSN CEO, Paul Carragher. “AkerBP is proud to be in front of the development of Bismuth as a barrier element with respect to Plug and Abandonment. In addition, this installation is proving that there is great savings potential in performing rigless P&A,” added Speaking about the project, Martin Straume, P&A Engineering Manager at Aker BP. Cathrine Bjaarstad, President Norway & Denmark, Altus Intervention said, “This project clearly demonstrates Altus Intervention’s ability to deliver innovative solutions and assist operators in resolving downhole challenges, adding value to their operations whilst creating both cost and time-savings”.